Plumpy was given out by the Advent Calendar and, Oh My Coltzan, a lot of people thought it was the cutest petpet ever. Well, Plumpy is actually a very cute petpet but not everything is as good as it seems. He definitively has a *few* terrible addictions so you have to be sure you can handle them. Should you get rid of your Plumpy as soon as possible? Maybe, that's always a possibility. But first, why don't you take a moment to read through the entire article and then you can make a decision. 1. Plumpy loves to eat bacon. 3. Plumpy will take any opportunity to steal your bacon. 4. Plumpy will also steal bacon from all your friends plates. 5. I removed all the bacon I had in my Safety Deposit Box and Plumpy decided to eat my Ice Draik Egg as revenge. 6. Plumpy doesn’t like vegetables. 7. Plumpy will only eat pizza if it has bacon on it. 8. Plumpy will only read a book if it is about bacon. 9. Plumpy will not be friendly to other petpets if they like bacon. 10. Plumpy looks like a fat Angelpuss. The difference is obvious, though. 11. I tried to give my Plumpy a Larnikin but he thought it was a potato and ran away. 12. Then I tried to give him a Scoach, he thought it was an exotic piece of bacon and ate it. 13. Then I gave up on giving petpetpets to him. 14. Plumpy was given out for free but now he is worth a few neopoints. Still not enough to make you rich, but you can easily go broke by buying him food. 15. I found out Plumpy also likes sugar and cakes. 16. One of the worst things is that Plumpy doesn’t like to brush his teeth. 17. Like all the kittens, Plumpy hates water. 18. Did I already mention Plumpy hates exercise? 19. I left a piece of bacon at the top of a tree on purpose and Plumpy actually climbed it. 20. After getting it, he started crying because he was too afraid to get back to the ground. 21. The only game Plumpy likes to play is Hungry Skeith, because he can eat all the cakes and all the other stuff the Skeith doesn’t like. 22. Plumpy has his own couch and he will bite you if you sit on it. 23. When I get mad at him, he doesn’t run, he hides underneath the bed. 24. You will never be able to paint Plumpy any color because he will always refuse to enter in the Rainbow Pool. 25. But, if you through a pile of bacon on it, then he might enter it. 26. 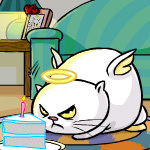 Plumpy doesn’t like to throw birthday parties because he has to share the cake and cookies with the guests. 27. But Plumpy likes to go to birthday parties because he can eat free food. 28. But Plumpy never sends gifts to anyone, especially the neopets that don’t have bacon in their party. 29. Plumpy is too chubby to jump over the table so your bacon and food are safe in there. 31. Plumpy can’t fly: wings are too small... body is too big. 32. He thinks he is cute this way, though. 33. He is indeed! But there are so many bad things about his behavior. 34. Plumpy doesn’t like to use his scratching post, he prefers the curtains. 35. Plumpy stole all my paint brushes and sold it so he could buy more bacon. 36. I decided to put all the food in the fridge so he won’t steal it. 37. I didn’t realize Plumpy was hidden in the fridge, so now there is nothing left to eat. 38. A good thing is that Plumpy really likes to help cleaning the house: he eats up all crumbs that have fallen into the floor. 39. On the other hand, the bad thing is that he throws all the vegetables into the garbage. 40. Plumpy is not a big fan of hygiene. Sometimes he really stinks. 41. Plumpy doesn’t like plushies because he thinks he is a plushie himself. 42. I tried to play with him once. He got mad and scratched my face. 43. I found out it was his nap time... So that explains a lot. 44. Plumpy’s routine is boring. He only has two different things to do daily: take a nap and eat bacon. 46. He growls instead, especially when he is hungry. 47. Or when he is angry. 48. It is really hard to annoy Plumpy; usually he annoys you first. 49. Plumpy likes to stay in a corner and then attack my feet. Not cool. BAD PLUMPY! 50. Plumpy snores at night and screams while dreaming… and it's always about bacon. 51. Even if TNT ever decides to make wearables for petpets, I bet none will fit Plumpy. 52. Plumpy attacks decoration plants because they remind him of vegetables. 53. When he does attack something, he gets really tired and sleeps the entire day. 54. He wakes up a few times, though... and then eats more bacon. 55. Plumpy likes to stare at me for hours. It’s kind of scary. 56. Plumpy also likes to stare at bacon. It’s even scarier. 57. Plumpy doesn’t like Lennies, he thinks they are too skinny. 58. Plumpy also doesn’t like Grarrls, he thinks they are a threat to his food because they eat a lot. 59. Plumpy hates bicycles because it reminds him of exercise. 60. Plumpy doesn’t like to go to the Kelp Restaurant... First, there's a lot of water surrounding it and second, it's too fancy for him. 61. Another thing he doesn't like in there is the fact that they don't serve bacon. 62. Plumpy doesn’t fit the Symol Hole. So, it is not a good idea to go there with him, he will end up stuck. 63. Did you ever get that message saying the omelette is all gone? Well… Now I know who ate it all *pokes Plumpy*. 64. Speaking of Tyrannia, Plumpy likes to spin the wheel of monotony. There, he finds the perfect time to take another nap. 65. Plumpy doesn’t like hugs. 66. Even though he doesn’t like vegetables, his best friends are vegetarians. 67. Plumpy doesn’t like Petpet battles, because it takes too much effort to battle. 68. Plumpy hates grey pets because they look too sad. 69. Plumpy also doesn’t like strawberry pets because they remind him of fruit. And fruit is really similar with vegetables. 70. Plumpy has to get the best place near the fireplace. 71. On the other hand, Plumpy doesn’t like summer because it makes him sweat, which reminds him of exercise. 72. Don't take your Plumpy to a trick-or-treat. Just DON'T! And don't ask. So, these were just a few things I noted about Plumpy's behavior and decided to share with you all. Even though I wouldn’t advise you to get Plumpy as a petpet, the truth is I could never get rid of mine. He is adorable the way he is, even with all his flaws and odd addictions *hugs Plumpy and hands bacon*. After the fall of Faerieland, Xandra's back at it again!